Hey there hoppers! Thanks for stopping in today- I am hosting a Motley Crew of Owls blog hop. Erin Prais-Hintz of Treasures Found, donated a handful of her handmade owl pendants for this hop. Each one is different, spunky and craaazy cool- So it will be fun to see what each of us made. I picked 5 random participants and the link list is at the end of this post. But first, here is my creation. I centered the owl on this asymmetrical beaded necklace. I used Vintage lucite nuggets, faceted purple crazy lace agate rondelles, and small golden yellow and olive green lucite beads . I created some seedbeaded rings using some beading wire, and matte seed beads, linked them together with some Vintaj Brass jump rings and wire wrapped some purple agate dangles inside each ring. Here's a good look at my shady little guy with the shifty gaze. 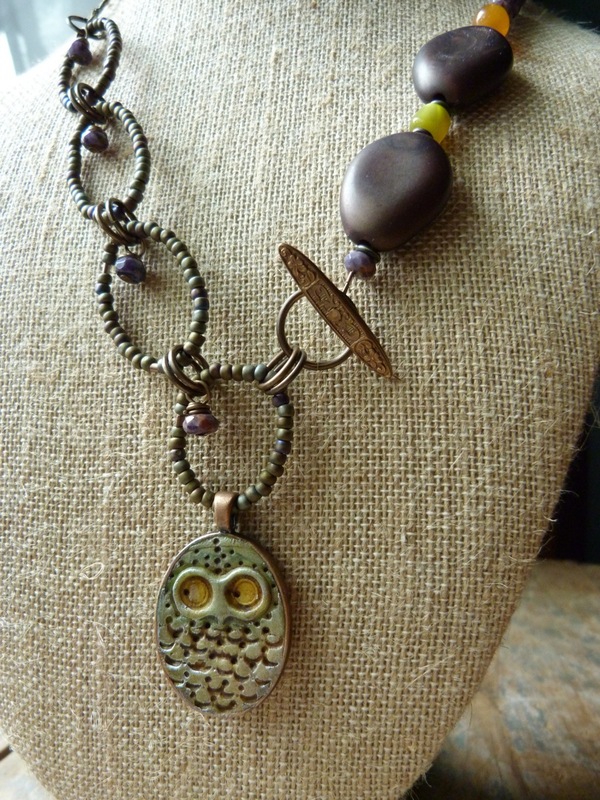 Love the earthiness of the colors with the olive green owl pendant. 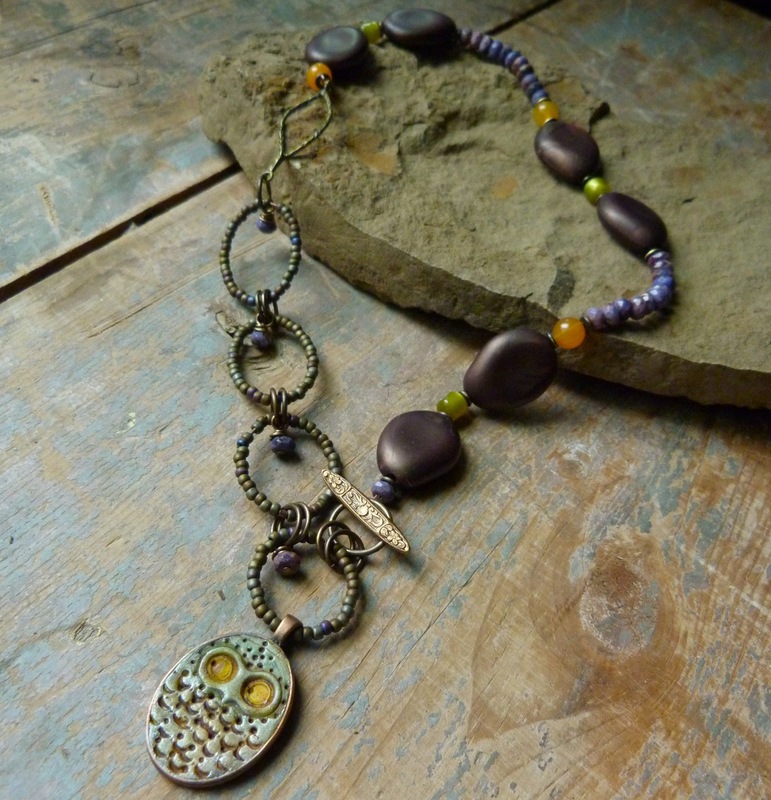 If you would like to order your own owl pendant, head on over to Erin's Etsy shop. Louise (does not have a blog) but will be sitting this one out unfortunately. Outstanding design!! Absolutely love it!! Great design Lorelei - love how you've mirrored the shape of the pendant in the beads and loops but with so much variety and contrast. I also love the color scheme! Beautiful earthy design! 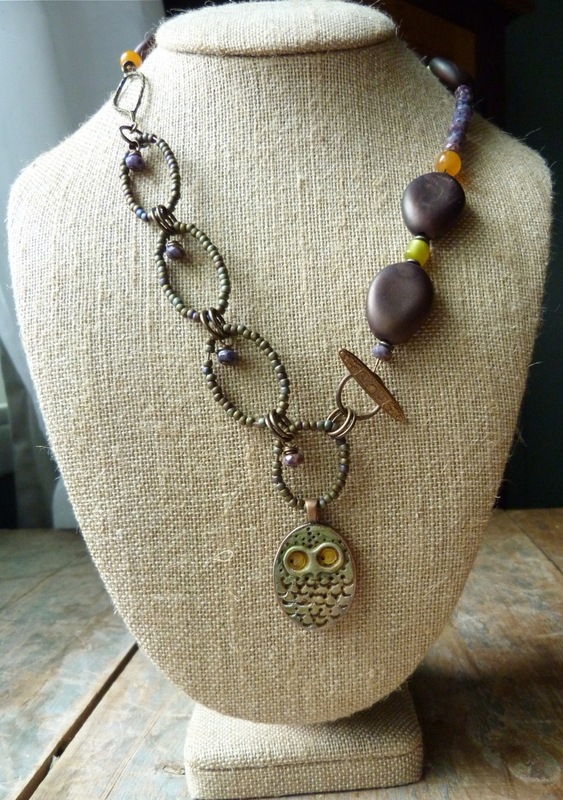 I love those seed bead links and your owl is just too cute! What a fun blog hop! 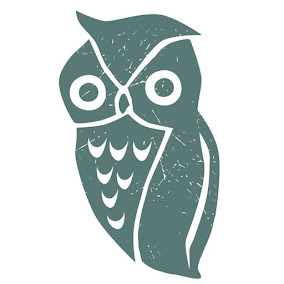 love the owls, and really like your design. 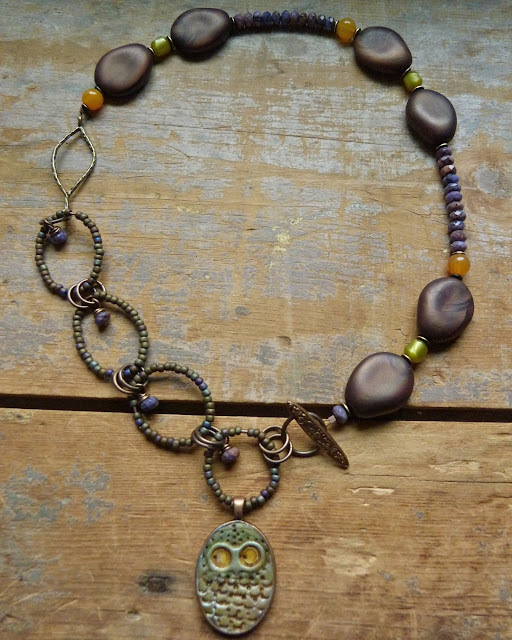 Agree with Lesley ... its great how you mirrored the owl shape throughout - love those bead loops! I love your darling necklace; the beads, the beaded circles, the assymetrical design (you are the queen of assymetrical design) and the purple rondelles. And your little owl looks a bit mischevious--better keep an eye on him. What a fun blog hop! That is so great - your owl is so cute!! I like the way everything blends-you are so wonderful at that. Those purple rondelles are my favorite - where did you ever find them? When I look at your work - I am in awe -you always have the perfect blend of beads, shapes and colors. I imagine that you must have at least a gazillion beads to choose from to make all your combinations just right!!!! Such an adorable owl to inspire you, and you surely were inspired! The first thing I noticed were the beaded links, clever idea Also love the crazy lace rondelles, great color combination. You excel with color and design, Lorelei! Nice work! What a great design! I love the woodsy, earthy feel of it, and your little owl looks very much at home. And those beaded rings are awesome! Great job! That is awesome! I love the beaded links and the rondelle drops. It almost looks like the owl is trying to make sure they don't fall on him. :) I hadn't noticed that you had mirrored the pendant's shape throughout the necklace until I read Lesley's comment. It works so well and is so subtle--wonderful! Great design, Lorelei. I love the earth tones and dimension you created. The Motley Owls are so much fun to work with. I had a great time with it! 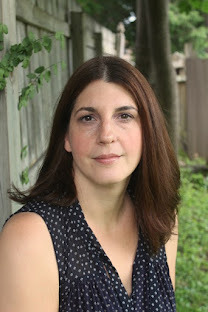 Thanks for the opportunity to be part of the blog hop, and to the creative artist Erin Prais-Hintz. Seems like the whole crew out their best feathers forward on this hop -thank you for organising it. Miss Lorelei! What an honor to have you work with this mischievous little Motley Owl. He really looks like he is about to pull a prank on you! Your design sense is just incredible. The shapes, the colors, the textures. I love the use of the negative space that leads my eye from Mr. Motley up the side. There is always unexpected delight in each piece that you create that makes me want to linger and discover something new. Thank you so much for hosting this fun hop and for sending the rest of the Motley crew soaring out into the world. I will reserve a special hug just for you at Bead & Button since I am not sure that I could ever do anything to repay you for you generosity of spirit. Beautiful work! I love the necklace design! Very lovely necklace Lorelei, I love the color combination. Thanks for letting me hop along with you! Love your owl, such personality! i'm a sucker for owls! I love your necklace, it is super cute! Love it! I love how you connected your beaded rings with the jump-ring-dangles! Your "shady little guy" is too cute! This necklace is definitely unique. I totally dig the seed bead circles you created for it. It gives the piece so much more volume. Neat.